The Battle of El Alamein was one of the most important of the Second World War. It was fought in the desert of North-West Egypt. The battle was to prove decisive in the North African Campaign. In this battle, some 300,000 men and some 1500 tanks were involved in a brutal battle. The outcome was a great victory for the British and the Imperial forces. They saved Egypt from German occupation and they also forced the German and Italian forces back into Libya. The Afrika Korps which had inflicted many defeats on the British are no longer a major force or a threat to the British in the aftermath of the battle. The Battle was actually composed of two battles. The First Battle fo El Alamein was fought in August 1942. This was where the British stopped the advance of Rommel and his Afrika Korps. 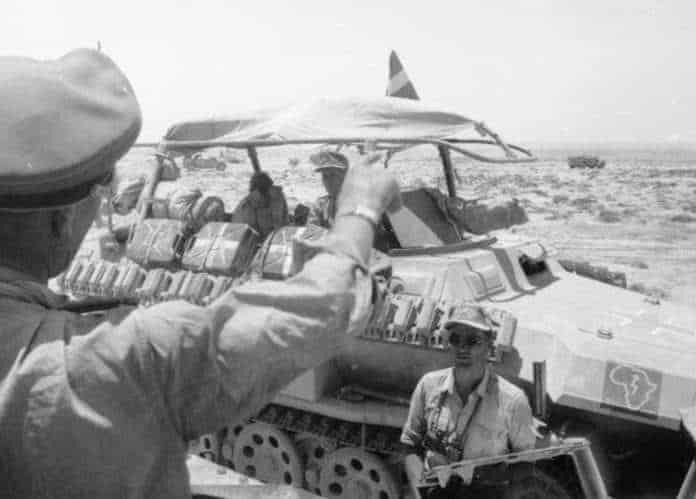 The Second Battle of El Alamein saw the British go on the attack in October 1942 and inflict a heavy defeat on the Germans and the Italians. Rommel or the ‘Desert Fox’ as he was known was not present at the second battle. He was recalled to Germany for urgent medical attention. However, his plans for the battle are followed by his subordinates. The commander of the British forces was replaced after the First Battle fo El Alamein. General William Gott was appointed as its commander but he was killed in a plane crash, before he could take up his role. Churchill then had Lieutenant-General Bernard Montgomery appointed as commander of the 8th Army. Mines played a very important part in the battle. The Axis and the Allies laid many miles of both anti-tank and anti-personal mines. The fighting at the Second Battle of El Alamein lasted for ten days. The battle was similar to a WWI battle, this was because it involved fighting from fixed positions and there was little movement. In the rest of the North African campaign, the fighting was very mobile. During a critical period in the Second Battle of El Alamein, the German commander, General George Strumme when he was inspecting the Axis forward positions died of a heart attack. He was replaced by Major-General Wilhelm Ritter von Thoma. The Allies received Sherman tanks from America before the Second Battle, and these proved to be very effective and gave Montgomery a decisive advantage on the field. Rommel returned to North Africa after he had received treatment during the Second Battle of El Alamein. He resumed his command and he began to direct the defense of the Axis lines. he helped to stiffen the Axis forces. however, the Axis had suffered a large number of casualties and soon were in headlong retreat. Many credit Rommel for saving the Afrika Korps in the immediate aftermath of its defeat at El Alamein. In the First Battle of El Alamein, the two sides had been evenly matched. But by the Second Battle, the Allies had almost double the men and tanks available to the Axis. The Battle had a great effect on British morale. They had never defeated the Germans in a major battle. After their victory, they had renewed self-belief and became increasingly confident of victory. As Churchill noted.